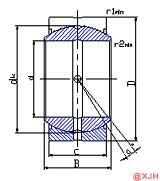 Spherical Plain Bearing The GE.ZO 2RS Series is actually a spherical plain bearing that can withstand loads in all directions, radial loads, axial loads, and combined loads for simultaneous radial and axial loads. It can be seen that its load capacity and impact resistance are very powerful, even if the installation is misplaced. As can be seen from the above characteristics, Spherical Plain Bearing GE.ZO 2RS Series can be used for lower speed swinging motion, tilting motion and rotary motion, so engineering hydraulic cylinders, forging machine tools, construction machinery, automation equipment, hydraulic machinery and other industries This product can be used.